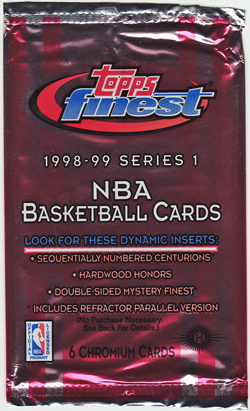 Earlier this week, I was rather surprised to see a few 1990s basketball boxes up for sale on eBay from a UK seller. I decided to grab hold of the 1998-99 Finest Basketball Series I box on offer and transport myself back in time 14 years, to a time when I was ripped open over half a dozen boxes of this particular release. 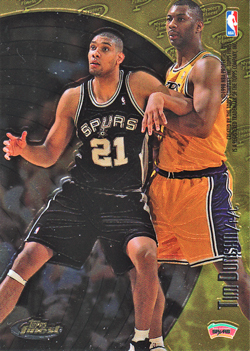 I seem to have ended up with most of the rookie cards from this set in my personal collection, but little else. So this break is aimed to go some way towards redressing matters for this particular issue and set me in the right direction to complete the set. The box provided 122 of the 125 base cards, with 11 doubles. So no complaints about the collation from the box. 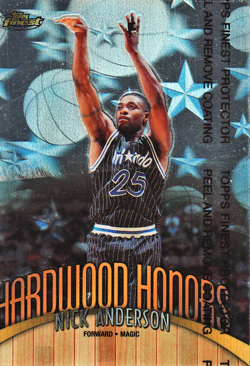 I also pulled out a Hardwood Honors (1:33) of Nick Anderson. I always felt that Anderson should have got more love doing his playing days. 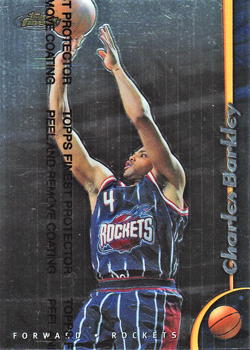 He provided strong support to Shaq & Penny, but will always be remembered for poor free throw shooting. 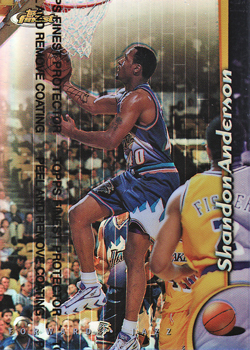 I struck out on the two refractors (1:12), landing common cards of journeymen Shandon Anderson & Isaac Austin. 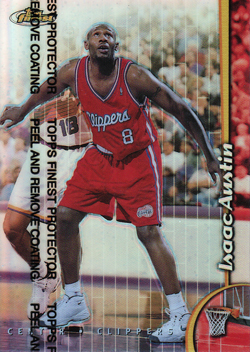 Although featured in a Clippers unifier, Austin played the 98-99 season with the Magic, having signed with them as a free agent at the start of the season. 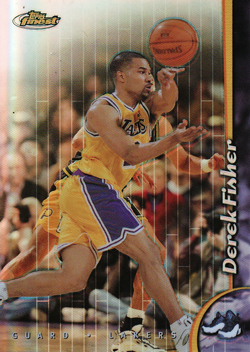 Finally the highlights of the box were a No Protector Refractor (1:24) of Derek Fisher and a Double-Sided Mystery Finest (1:33) card featuring Tim Duncan & Keith Van Horn. If anyone else reading the blog collects, this set give me a shout...I have a number of spare RCs, that I will happily trade.